French scholar; born at Sulz (then in the French department of the Upper Rhine) August 5, 1802; died at Frankfort-on-the-Main Feb. 15, 1875. His real name was Goschel David Behr (or Baer); the name "Carmoly," borne by his family in the fourteeenth and fifteenth centuries, was adopted by him when quite young. He studied Hebrew and Talmud at Colmar; and, owing to the fact that both French and German were spoken in his native town, he became proficient in those languages. Carmoly went to Paris, and there assiduously studied the old Hebrew manuscripts in the Bibliothèque Nationale, where he was employed. Several articles published by him on various subjects in scientific papers made him known; and on the establishment of a Jewish consistory in Belgium,he was appointed rabbi at Brussels (May 18, 1832). In this position Carmoly rendered many services to the newly founded congregation, chiefly in providing schools for the poor. Seven years later, having provoked great opposition by his new scheme of reforms, Carmoly resigned the rabbinate and retired to Frankfort, where he devoted himself wholly to Jewish literature and to the collection of Hebrew books and manuscripts, in which he was passionately interested. Carmoly's works have been severely attacked by the critics; and it must be admitted that his statements can not always be relied upon. Still, he rendered many services to Jewish literature and history; and the mistrust of his works is often unfounded. 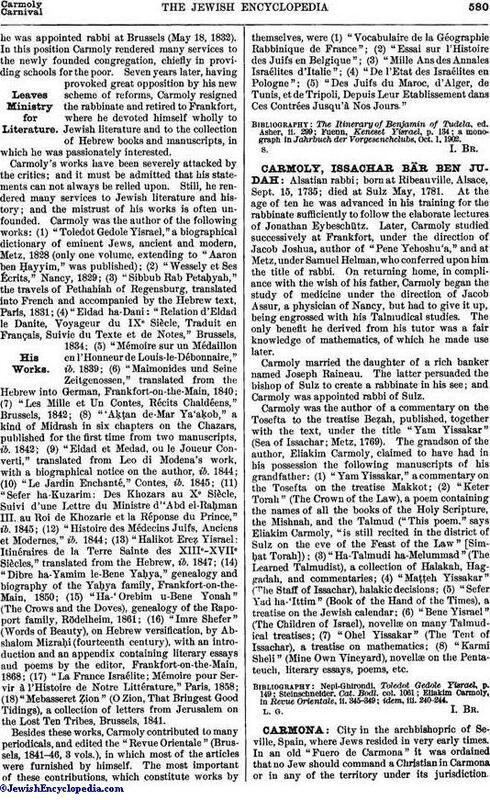 Carmoly was the author of the following works: (1) "Toledot Gedole Yisrael," a biographical dictionary of eminent Jews, ancient and modern, Metz, 1828 (only one volume, extending to "Aaron ben Ḥayyim," was published); (2) "Wessely et Ses Écrits," Nancy, 1829; (3) "Sibbub Rab Petaḥyah," the travels of Pethahiah of Regensburg, translated into French and accompanied by the Hebrew text, Paris, 1831; (4) "Eldad ha-Dani: "Relation d'Eldad le Danite, Voyageur du IXe; Siècle, Traduit en Français, Suivie du Texte et de Notes," Brussels, 1834; (5) "Mémoire sur un Médaillon en l'Honneur de Louis-le-Débonnaire," ib. 1839; (6) "Maimonides und Seine Zeitgenossen," translated from the Hebrew into German, Frankfort-on-the-Main, 1840; (7) "Les Mille et Un Contes, Récits Chaldéens," Brussels, 1842; (8) "'Aḳṭan de-Mar Ya'aḳob," a kind of Midrash in six chapters on the Chazars, published for the first time from two manuscripts, ib. 1842; (9) "Eldad et Medad, ou le Joueur Converti," translated from Leo di Modena's work, with a biographical notice on the author, ib. 1844; (10) "Le Jardin Enchanté," Contes, ib. 1845; (11) "Sefer ha-Kuzarim: Des Khozars au Xe; Siècle, Suivi d'une Lettre du Ministre d''Abd el-Raḥman III. au Roi de Khozarie et la Réponse du Prince," ib. 1845; (12) "Histoire des Médecins Juifs, Anciens et Modernes," ib. 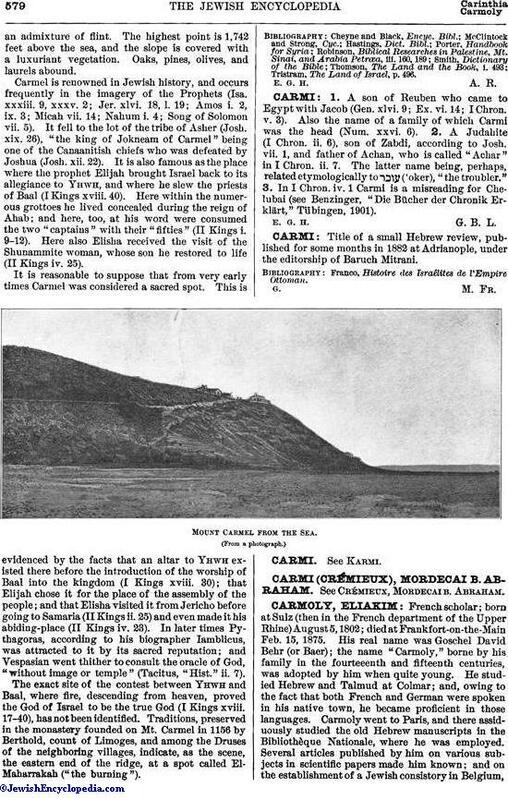 1844; (13) "Halikot Ereẓ Yisrael: Itinéraires de la Terre Sainte des XIIIe-XVIIe Siècles," translated from the Hebrew, ib. 1847; (14) "Dibre ha-Yamim le-Bene Yaḥya," genealogy and biography of the Yaḥya family, Frankfort-on-the-Main, 1850; (15) "Ha-'Orebim u-Bene Yonah" (The Crows and the Doves), genealogy of the Rapoport family, Rödelheim, 1861; (16) "Imre Shefer" (Words of Beauty), on Hebrew versification, by Abshalom Mizraḥi (fourteenth century), with an introduction and an appendix containing literary essays and poems by the editor, Frankfort-on-the-Main, 1868; (17) "La France Israélite; Mémoire pour Servir à l'Histoire de Notre Littérature," Paris, 1858; (18) "Mebasseret Ẓion" (O Zion, That Bringest Good Tidings), a collection of letters from Jerusalem on the Lost Ten Tribes, Brussels, 1841. Besides these works, Carmoly contributed to many periodicals, and edited the "Revue Orientale" (Brussels, 1841-46, 3 vols. ), in which most of the articles were furnished by himself. The most important of these contributions, which constitute works by themselves, were (1) "Vocabulaire de la Géographie Rabbinique de France"; (2) "Essai sur l'Histoire des Juifs en Belgique"; (3) "Mille Ans des Annales Israélites d'Italie"; (4) "De l'Etat des Israélites en Pologne"; (5) "Des Juifs du Maroc, d'Alger, de Tunis, et de Tripoli, Depuis Leur Etablissement dans Ces Contrées Jusqu'à Nos Jours." a monograph in Jahrbuch der Vorgesenchclubs, Oct. 1, 1902.